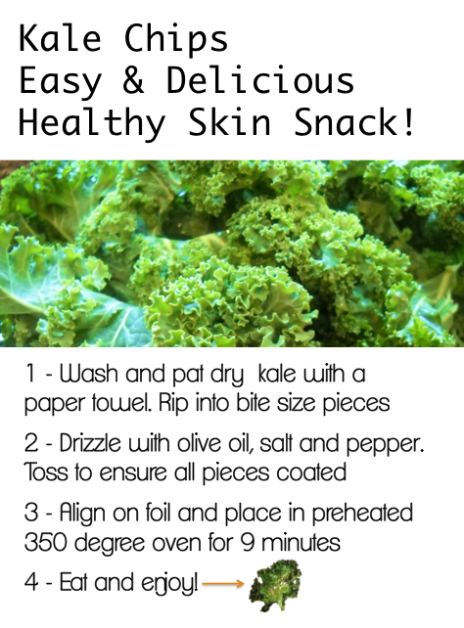 DIY Kale Chips: Easy and Delicious Healthy Skin Snack! "Oooh ooh, I just have to share a recent favorite snack!" Kale Chips!!!!! They can be homemade or purchased at the store. if you’ve never made these before, it's quite easy. Yup, the entire process takes less than 15 minutes! Affordable and quick! Tip: I like to add all sorts of seasonings and cold pressed oils to my kale chips. Experiment! Kale is an excellent source of phytonutrients as well as Vitamins A, C, and K, and calcium, which represent some of the requisite nutrients for skin health. Kale is also one of the richest sources of lutein and contains beta- carotene, which improves skin elasticity and firmness.